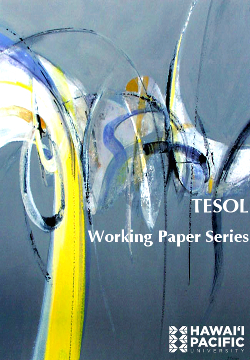 The TESOL Working Paper Series is a refereed, open-access journal that is published annually by the TESOL program in the Department of English and Applied Linguistics at Hawaii Pacific University. It publishes papers related to the field of second or foreign language teaching, particularly the teaching of English to Speakers of Other Languages (TESOL). Papers in this series tend to be small-scale empirical studies, action research, theory-to-practice reflection, or practical teaching ideas (see Aim and Scope in the "Call for Contribution"). Using Spanish in the ESOL Classroom: Which Spanish Do You Choose? What does Pidgin sound like today? Developing Grammar II: Simple Past Tense, Trang Hung Son, Dung thi Nguyen, & Edwin Davis, Jr.
CORPUS LINGUISTICS: A TOOL FOR A CRITICAL APPROACH TO LANGUAGE TEACHING? LESSON PLANS: EVERYDAY LANGUAGE FUNCTIONS FOR IMMIGRANTS TO THE U.S.
All volumes produced PRIOR to Volume 4, Issue 2, Fall 2006 are available only in print. Please contact Dr. Hanh Nguyen at hnguyen@hpu.edu for further information. COVER IMAGE: "Calligraphy I," watercolor painting by Barbara Kellogg, 2011. Reproduced with permission from the artist. The contents of the papers in the TESOL Working Paper Series do not necessarily represent the views of Hawaii Pacific University.